If you’ve ever tried to identify your WWII veteran’s transport to Europe, Africa or Iceland (etc.) you know the difficulties of dissecting the large convoys carrying thousands of men and women to their destination. As soon as I hear “convoy” I cringe. 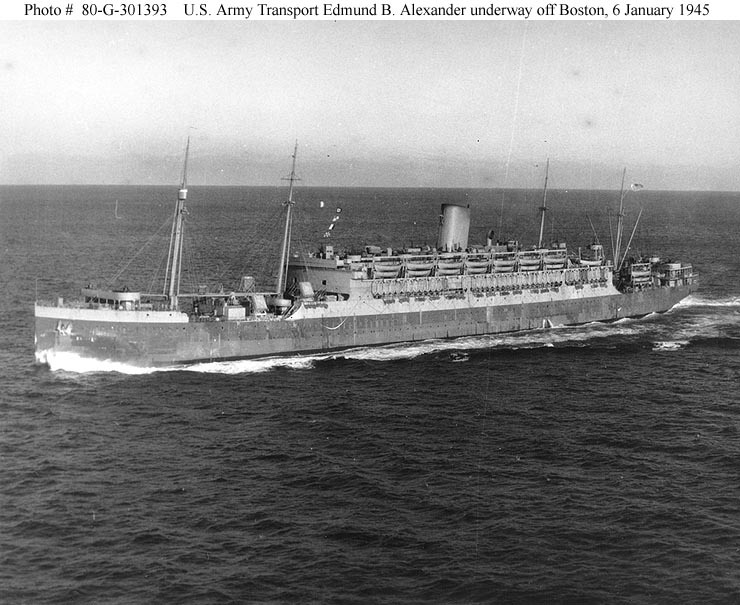 The Edmund P. Alexander, a ship originally made for 1000 passengers, carried up to 5000 military personnel in any of its multiple WWII runs. At some point the convoys divided and took various routes to European and African destinations. Where do you begin with defining your WWII veteran’s destination? To best define your ancestor’s crossings, start with the departure date. This departure date may be found on discharge papers, or in unit Morning Reports. The goal is to uncover as much activity as possible. That’s Step I. Matching timelines of your ancestor’s military activity and troop activity would be the second step. As mentioned, researchers may find departure dates on your veteran’s discharge papers, commonly known as DD214. 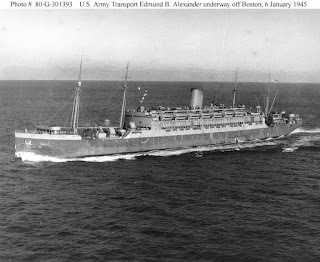 Using this process, I was able to narrow my veteran as having been a part of the transport ship Edmund P. Alexander. It was the only ship that left on the departure date specified on his DD214. By tracing this ship, I was able to confirm that my veteran indeed served in Iceland. There are various websites dedicated to ship departure dates. The Edmund P. Alexander saw a lot of activity during WWII. So the first key is to gather information, and later you can narrow by dates and activities. Use Obituaries for Clues. Obituaries give us clues of ship events and passenger experiences. Of course you must verify the right passage and timeline, but here’s an example of what can be retrieved from an obituary. Did my ancestor's unit experience this explosion? Must check this date on the Morning Report. As I mentioned, I’ve cast a large net in order to identify my veteran’s European transport. So even unrelated biographies that detail experiences are useful. The Experiences of Lieutenant Dorothy M. Taft during WWII, from the Battle of the Bulge Memories, provides detailed information on the Edumund B. Alexander. Again, I will have to verify timelines and activities to that of my veteran before accepting, but this description may play a vital role in my research. Of course with the gathering of historical data and facts - ship records of the Edumund B. Alexander, timeline of Unit activities, etc. - these basic resources, may provide just the hint you need to further your research. Im going to look into this. I have my Dads unit activities once in Europe (Army sent to me) but there is nothing about how he got there. Thanks for posting!